the bikeshed is as much a part of british heritage as fish and chips, chicken tikka masala and streets paved with gold; few members of the great british public in the middle of last century owned cars and thus needed a garage. a garden shed was a castle in the back garden which, if anything like thewashingmachinepost version, surrounds the bicycles, tools and odd components with garden rakes, spades and half empty tins of paint, not only of indeterminate colour, but matching none of the contemporary decor throughout the house. however, the bike shed's influence stretched a lot further than the personalised accoutrement of somewhere to store stuff, including bikes. many are the schools across the country which either have or had bikesheds, though the current vogue for giving the kids a lift to school has probably rendered redundant most of those remaining in existence. of course, to define this traditional abode as a bike shed, it was requisite that it fulfilled a greater purpose than that of simple containment. to inhabit a temporal space of bikeness, fixing and repairing had to be part of the deal; thus inner tubes, the odd spare tyre, a tyre lever or two and maybe a track pump should be seen to be almost carelessly lying about the inner sanctum. that's what made an otherwise innocent shed into a bike shed, always assuming at least one bicycle was cossetted inside. some people, however, take these things to extremes. i used to think that meant me, as there is a black and decker workbench against the back wall bearing a var wheel truing stand and an industrially capable vice that was once used to hold the ceramic tiles from the space shuttle (actually, i made that bit up, but it is a very big vice). all around are a wide range of tyres that no longer fit anything capable of human propulsion, and a shelf overladen with as many different sizes of inner tubes as it is seemly to offer to the islay public. and there's a lezyne floor drive track pump. but i have been outdone by my mate dave. dave seaman lives in aberdour, fife, scotland. he used to work in local and central government, latterly concerned with transport and cycling policy. 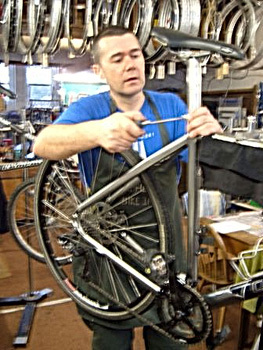 however, no doubt even the hardest status quo fan gets fed up with headbanging after a length of time, and dave recently took the opportunity to cast his horizons wider, embarking on a new career as a bicycle mechanic, opening the alarmingly well-equipped and oversized dave's bike shed. intriguingly, the position of bicycle mechanic seems to hold greater cache than the equivalent motor mechanic. perhaps i just lead a sheltered life, but i haven't heard anyone refer to a bicycle maintenance technician as a grease monkey. sometimes status is everything. as one who is geographically challenged, i have little social or topographical knowledge of dave's locale, so i was concerned that the very rural sounding aberdour would have a sparse number of cyclists. would he spend his days drinking coffee and re-arranging his cone spanners? however dave tells me "i'm sure that in the 25 mileish radius that takes in central and west fife, edinburgh and lothians, there are a lot of cyclists.Êmy seven years of commuting from fife to central edinburgh witnessed a big growth in numbers; edinburgh cyclists modal split is reckoned to be 10% in some wards." so, satisfied that dave's bike shed would have a financially secure future ahead, the big question that i was desperate to ask was "why leave the comparative security of a job in government (a little topical humour there) for the uncertaintly of the bicycle repair trade?" 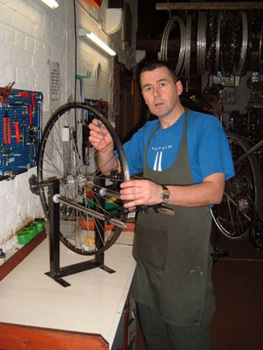 ""the current financial/economic situation presented the opportunity toÊtake a severance package from the civil service and fulfill an ambition to be self-employed, and use a skill i've had since my dad showed me how to service hubs, bottom brackets, true a wheel etc. when i was about eight, bikes were transport in our family; i even remember working on rod brakes, westwood and westrick rims." one of the delights of rurality is the difference of expectation, particularly on the part of bicycle owners, from those on carbon wonderstuff to the supermarket cheapy. this has obviated the need for a large shopfront with its concomitant large overheads. and then there's the getting out and about; dave is just as happy to bring tools and expertise to the recalcitrant velocipede as he is happy for the bicycle to be brought to the bike shed. but is there a need for repair, particularly when some of the bicycle shaped objects on sale today are cheaper to replace than to fix? could he be confusing perceived need with his own desire to become bicycle repair man? there is, i believe, a need in this area for someone to repair bikes that is not a retail outlet and be able to charge prices commensurate with the low overheads i have with a home-based business. it's also easier to be honest with people and fit decent secondhand stuff.Ê the economics of bike mechanics for sub £300 rrp on new bikes, is stacked against repair; one hour's labour at typically £28-35, and parts at retail prices mean that it's often cheaper to pass on a bike to a recycler and buy this year's model.Ê witness the great success of the bike station in edinburgh and now perth." i have been my own, and the island's, bicycle repair man for almost twenty years now, but based on the notion that not only am i obsessed with bicycles, but i have great interest in how they work and how to repair them when they go wrong. there are certain jobs i cannot undertake simply because the tools for doing so are uneconomic to own, particularly on the basis that they might be used, rather than the certainty they would be. i believe it is still possible in this day and age to step out the front door and declare to the world 'i am a bicycle mechanic', but surely safer and more professional to have had some training in the art to which one has nailed one's colours? 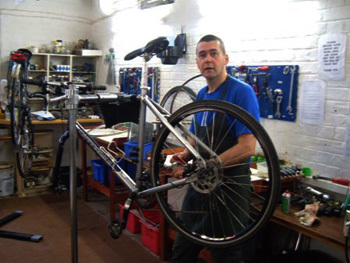 "i have the city and guilds bike maintenance qualification and the bike inn certificate of attainment. this goes beyond cytech one, two and three; hydraulics, wheelbuilding and frame geometry are not part of the cytech syllabus, but they are at the bike inn.Ê propretor alf webb has a lifetime's experience in the cycle trade - he is 73 - his knowledge and enthusiasm towards his students is 110% and instruction is peppered with anecdotes and stories.Ê for example; spokes araldited in place, seven-speed freewheels fitted on five-speed spaced axles, cantilever brake levers fitted to v braked bikes. it was an education in itself." my own experience of setting-up the bike repair hub of the hebridean universe consisted of purchasing a few inner tubes and some brake and gear wires, and hoping no-one asked for something i didn't have. however, in these modern, technologically challenging times, this would be seen as merely a stopgap and particularly amateurish display of what truly was/is amateur hour in the bike shed. was the setting up of dave's bike shed a fiercely expensive undertaking? "training, tools, marketing, initial stock purchase for about the same cost as aÊtop endÊcarbon eleven-speed road bike and a pair of assoss bib longs!" i do admire someone who has the patience, the gumption and the temerity to live the dream, whatever that dream may be. to quote a particularly topical and well-worn cliche in the current economic climate, it's the minority who have the confidence to step into the unknown, particularly when peer and social pressure edges us all towards upward mobility. more the executive path than the practical workman/woman. even better is the desire to not only maintain the bicycle of your fellow man, but to give something back by way of advocacy for those who have yet to accept the way of the bicycle, or simply at the rudimentary end of the art, and care for the safe passage therof. "i'm a sustrans ranger; the ncn 76 path is ten miles from my house. i've gained a set of skills from local and central government employment that means i know my way around policy administration, and in march of this year, i intend to become a qualified cycle trainer via cycling scotland training, setting the tone of my advocacy. i'm happy to leave the shouting to others. Ê "creating a public that wants to and is able to cycle, will bring round political attention and resources to the needs of cyclists. the time is now." words that i'm sure most of us would echo, if only from the safety of our own bike sheds. as i said from the outset, dave seaman is a buddy of mine, and as such i wish him every success in this new venture, but not just for his own moral and financial well-being, but because he is but a small part of a bicycle movement that continues to grow, but far wider than just in aberdour, fife. 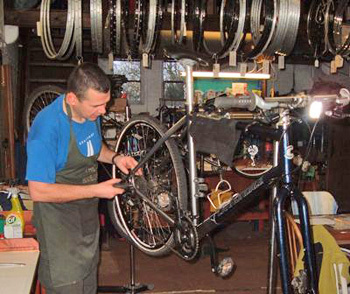 you can contact dave via his website, more especially if you live in the area and your bicycle has need of some tender loving care.